Sylvan goes to extremes to make sure your pontoon is a reflection of your bold personality. Sylvan expanded its S-series with the mid-sized S3 model. While smaller in size than the S5, it still packs all the attitude that made its larger sibling such a hit. Extreme is not a word most people associate with pontoons, unless it’s in the context of something peripheral: “Man, I am extremely tired; I think I’ll take a snooze on the rear lounger.” But on the Sylvan S3, the word Extreme appears in the name of the boat, and it earns it with a package that ratchets up the cool factor. Here, Extreme is a package of all things black on its sporty S3 model. First, the anodized fence rails, deck and skirt trim, and forward-swept tower are black. And blackest of all are the ebony-painted pontoons that would do a Sith Lord proud (obligatory “Star Wars” reference). Superimposed on the black fencing of our test S3 was a slash of high-visibility blue on the downward-swooping panel that lets them know you are coming. The Arctic upholstery group includes matching piping and trim for a custom look. The blue matched well with the purplish-blue side lighting that delivers nighttime attitude and more visibility for added safety. The S3 comes with lime green, hot red and bright yellow accents, too, if you’re not feeling blue. Performance on a pontoon boat hinges on its ability to reduce wetted surface and its evil twin, drag, by getting its tubes on top of the water. Lifting strakes are near-horizontal attachments that give round tubes flat surfaces that get a pontoon on plane. But Sylvan engineers took a look at “regular” monohull boat bottoms and correctly deduced that if the pontoon bottom were shaped like that, it would be even more efficient; hence, the Revolutionary Planing Technology (RPT) tube was born. Our test S3 not only sported twin RPT tubes on the outsides but also had the optional PR25 center tube, a round 27-inch tube that has a couple of cool features. 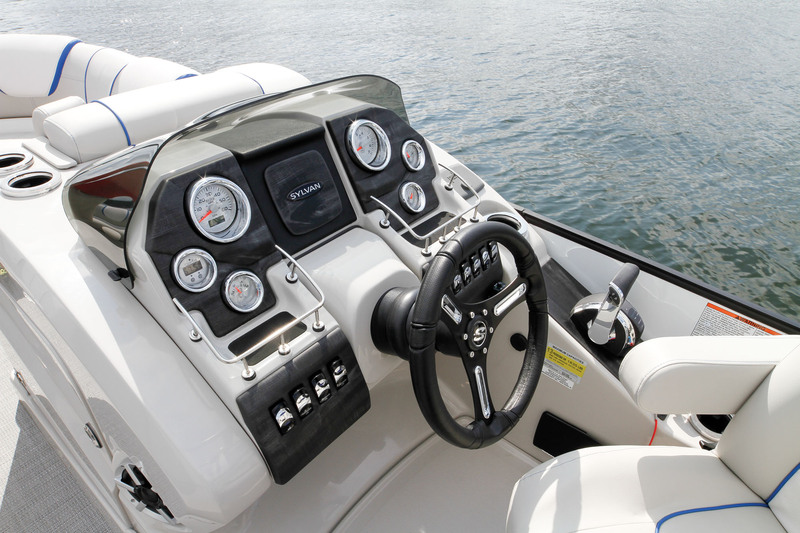 It has twin lifting strakes that provide more buoyancy underway, and it sits farther back to create a transom for longer-shaft, high-performance engines such as the Mercury 250 Verado, which has a 25-inch shaft and an intercooled supercharger for instant throttle response. This potent combo put the S3 Extreme on plane in only 2.2 seconds and took it to 30 mph in 7.4 seconds. The PR25 Performance package includes an aluminum underskin that reduces drag and noise and a 60-gallon fuel tank mounted in the center tube that gives the S3 plenty of range while keeping it in balance. Hydraulic steering comes standard with the Performance package, as does a removable ski pylon. Top speed with a high-revving 250 Verado was 45 mph at 6400 rpm. At the helm, the Digital Throttle and Shift (DTS) delivered drive-by-wire control that was beyond smooth. The benefits of the PR25 Performance package don’t end with enhanced speed; they carry over to the S3’s handling. The RPT design mimics a V-hull with 14 degrees of deadrise. It squares off as it moves upward from the V and morphs into hard chines — similar to the lifting strakes on the center tube — that provide lift and direct spray down and outward, for a drier ride. Introduced six years ago and now on its third generation, RPT has undergone a few changes, foremost of which is a beefy nosecone design that starts with a 0.100-inch-thick sheet of aluminum reinforced by twin bulkheads that keep it rigid so it can survive high-speed wave bashing. Since V-shaped tubes slice through the water, the ride is significantly smoother, especially when running through choppy conditions. Because the tubes are all 27 inches and the center tube isn’t set deeper, the S3 doesn’t lean significantly during hard turns, but it hooks up really well and is just a bit more nimble than its larger S5 stablemate. Full-length keels help the S3 track straight, and they provide protection for the tubes while pulling up to and leaving a beach. 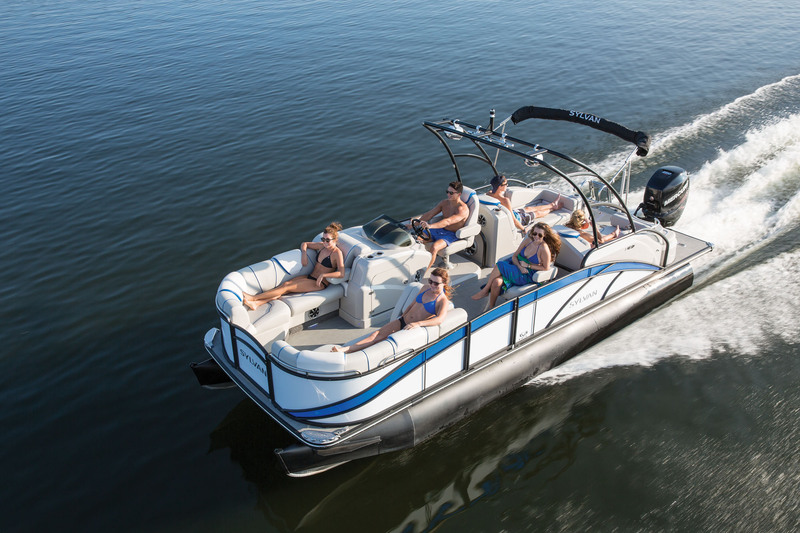 One look at our S3 Extreme test boat showed me it was maximized for watersports fun. The black tower provides the high tow point wakeboarders prefer, and for slalom fans there’s a stout, removable ski pylon. 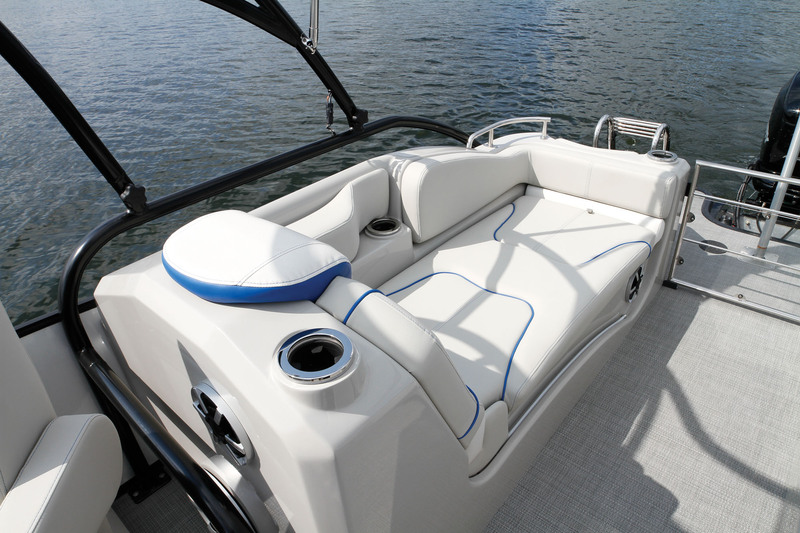 For hanging out or booting up for a run, there’s a pair of jumpseats on the swim platform that also have wet storage for tow ropes and vests. On most of the seat bottoms on the S3, the large decorative piping is wisely recessed to minimize its tactile impact, but it lies atop the seats, and you can feel the piping when you sit down. 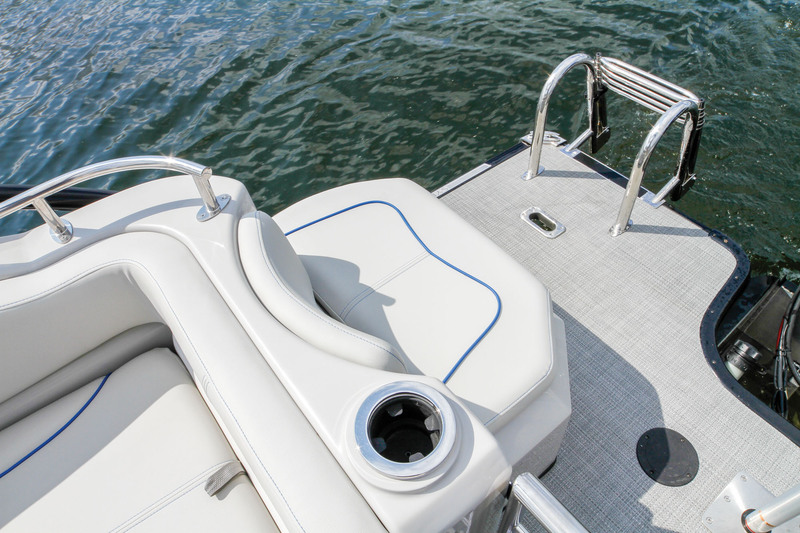 A centerline in-tube ski locker provides storage, and the swim platform is one of the largest on an outboard-powered pontoon. Our boat was clad with gray Sea Weave flooring, which is a good choice for owners with kids who stay perpetually wet. The twin rear loungers make the perfect “lazy boy” ski observation seats, and the starboard chaise seat bottom houses the pop-up changing station that can accommodate a Porta Potti — just flip it up. One option we would like to see is a freshwater shower in addition to the available raw-water washdown. This pontoon’s all about getting horizontal, as evidenced by the two pairs of chaise lounge sofas fore and aft. Our boat had the optional set of three filler cushions with support bars; they fill in the space between the rear loungers to form a giant sunpad for group tanning. To the left of the captain’s bucket was another seat that looks similar but had a popup footrest á la Barcalounger. And our S3 also had the premium stereo upgrade — a Bluetooth Polk system that included twin subwoofers that can be controlled at the helm. 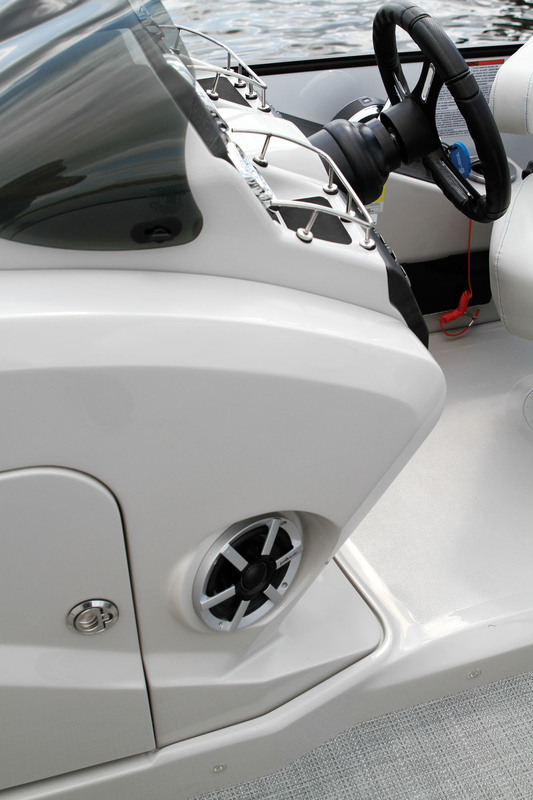 The optional Wakeboard tower had twin coffee-can speakers, to provide skiers with a personal soundtrack, and an integrated Bimini top for shade. In addition to the side panel lighting, underwater lighting and lighted cupholders are options, for post-sunset cruises. Purchased by Chris and Cathy Baugher, plus Logan, 10, Redkey, Ind. Purchased at Pro Wake Watersports, North Webster, Ind. We wish we would have gotten a larger engine than the Yamaha F150. My folks used to have a small runabout and loved boating, so when we bought a place on Lake Tippecanoe, my wife, Cathy, and I knew we wanted a boat. At first we weren’t sure what to get; it had to be versatile enough to handle watersports and fishing but big enough to take out our friends. The S3 is perfect for us. My son, Logan, really likes skiing and tubing, and this summer he wants to learn to wakeboard. The rear jump seats make a great place to fish. We’ve had as many as 12 of our friends on board, and there was plenty of room for everyone. 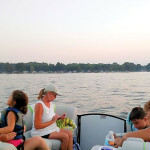 Tippecanoe is a beautiful lake and often we just cruise around and look at the houses. Sometimes we go to Pie Eyed Petey’s and get one of their great pizzas. Pro Wake Watersports has been great. When we bought the boat, they spent a lot of time showing us how everything works and made sure we were comfortable. We had a warranty issue with the trim, and they sent a tech out to us and fixed it at our dock. LOA: 24 ft., 10 in.